The F-512 has been a staple of the Guild line since the late 1960s. 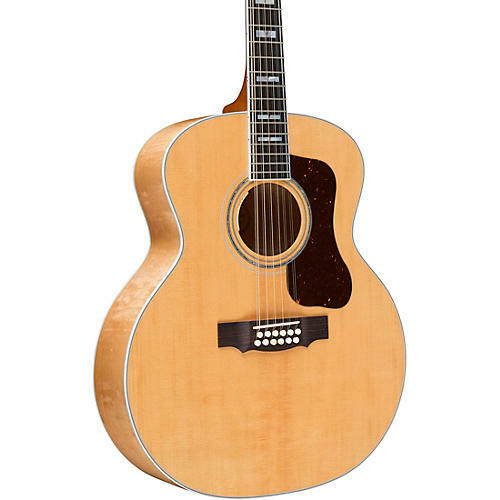 The modern F-512E Maple Jumbo 12-String acoustic-electric guitar features a tight-grained solid Sitka spruce top with arched flamed maple back and maple sides. Created on the same arch press that’s been a part of Guild manufacturing since 1985, the F-512E Maple Jumbo 12-string provides sharply focused trebles and an articulate midrange, perfect for a full, centralized, harp-like sound. Braced with delicate, scalloped Adirondack spruce, this model produces the shimmering highs that players have come to expect from a Guild 12-string. The F-512E Maple Jumbo 12-String acoustic guitar's cosmetic appointments include the classic Guild “V-block” inlays, gold Gotoh hardware and a beautiful Nitrocellulose lacquer finish. Exceptional build quality and premium specifications make it a worthy heir to the historic Guild 12-string legacy.